Ari (left) and Andrew Cohen, bringing you vegan ice cream in Emeryville and Albany, courtesy of Mr. Dewie’s. Summer officially begins June 20, but any season is a good time to treat yourself to some frozen goodness. Luckily, we live among plenty of ice cream parlors, boba shops, and gelaterias here in the East Bay. Of course, we also have crowd favorite Fentons Creamery and Restaurant, made even more popular by its cameo in Pixar’s Up. The list of go-to spots for ice cream is not comprehensive, and some will balk at places left off. In Chinatown alone, there are probably a dozen spots to get a red bean iced drink or avocado smoothie. When it comes to cold treats, we have an embarrassment of riches. Here are eleven of the best, lesser-known, or most unique places to get a frozen dessert around town. Looking for a dairy-, soy-, and gluten-free option? Mr. Dewie’s has you covered with its two outposts, one on Solano Avenue in Albany and the new stand in the reconfigured Emeryville Public Market. The ice creams are cashew-based and are rich and smooth, and the ingredients are almost all organic. For $4, you get a “single” scoop, which is actually two huge scoops, and you can even pick two flavors. Gluten-free cones are available for an additional 50 cents. Try the almond caramel, which is the most similar to regular ice cream. MrDewies.com. Ici is the gold standard for a nouveau-style creamery. 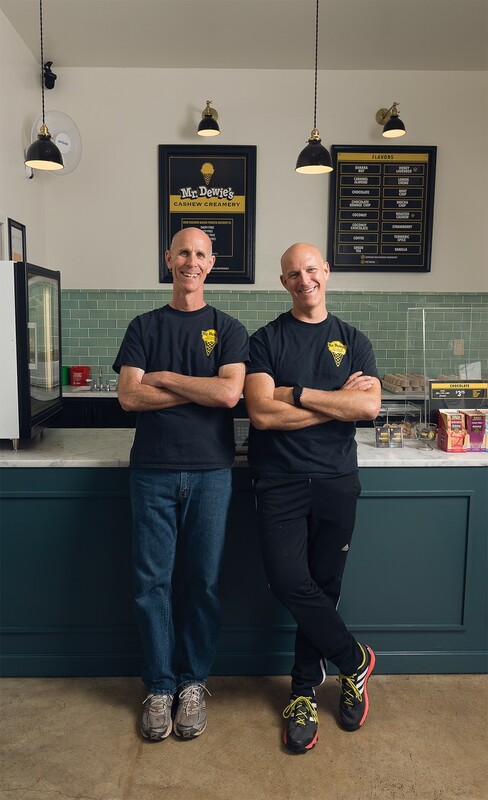 It’s no wonder that their ice cream is so friggin’ delicious — the founder is a former pastry chef at Chez Panisse, who opened the Elmwood shop in 2006. Flavors like orange rosemary toffee or lime marshmallow may sound too fancy, but Ici’s scoops taste how great ice cream should: perfectly creamy and satisfying. The ice cream and other desserts are made from scratch using organic dairy and eggs. There’s a perpetual line out the door in this Berkeley neighborhood spot, but it’s well worth the wait. No other place makes hand rolled cones that have chocolate at the bottom to prevent ice cream leakage. Genius. 2948 College Ave, Berkeley, Ici-IceCream.com. Everything about Sweet Belly is cute and refined. Try the popular “sweet deal”: ice cream that comes out of a soft-serve machine, a topping, one mini donut, and one drizzle. Donuts are made to order and covered in your choice of toppings, from matcha sugar to orange zest. Two ice cream flavors are available at a time, with flavors revolving monthly. There are 15 toppings alone to choose from, including caramel coffee popcorn, or their cinnacrisp, made from cinnamon, sugar, and Rice Krispies. Think of the toppings and drizzle as the bling of your ice cream. This new Uptown spot will make your Instagram, and belly, happy. 435 19th St, Oakland, SweetBellyDesserts.com. Curbside in Oakland’s Temescal Alley is another vegan-friendly joint. Scoops, sandwiches, and soft serve are what they hawk — and they even sell pie a la mode. Curbside’s six vegan flavors are mostly made from cashew cream, but at least one is a sorbet, along with two soft serve flavors (one vegan). The pre-packaged ice cream sandwiches taste surprisingly fresh, too. There’s a lot packed into this small neighborhood shop. The additional $1 for waffle cones is worth it; they’re made fresh, and come in regular and chocolate flavors. 482 49th St, Oakland, CurbsideOakland.com. Tara’s is one of the original East Bay shops to serve organic ice cream with unique flavors. Besides knowing the ice cream is all-natural, Tara’s has some of the best flavors, such as Bay Laurel, yerba mate, and garam masala. The scoops are as delicious as they sound. Visit one of two storefronts on College Avenue in Berkeley; or in Temescal, just a block from Curbside. Or, see if you can find the mobile trike at Oakland’s First Friday or at the Lake Merritt farmers market on Saturdays. TarasOrganic.com. Where else can you get eight flavors of vegan gelato? The popular San Francisco gelateria Holy Gelato! opened shop in Old Oakland last year. With two dozen flavors to choose from, and eight of those dairy-free, there’s something for everyone. 815 Washington St, Oakland. Loard’s Ice Cream is straight vintage East Bay. Its tried-and-true recipe is a throwback to the simpler days of ice cream. And even though there are more than a dozen shops throughout the Bay now, the original store that opened in 1950 is still standing on MacArthur Boulevard in Oakland. Loard’s keeps it old school with some newer flavors that reflect changing palates. For example, those who love Filipino desserts can enjoy flavors such as ube (taro), macapuno (coconut) and halo-halo (a mix of flavors like the shaved ice dessert). Loards.com. Do you wanna build a snow ice? Vampire Penguin’s melt-in-your-mouth desserts are a newer take on traditional Taiwanese shaved ice, allowing for fun flavor combinations such as green tea snow with crushed Oreos, strawberries, almonds, and condensed milk. The “snow” is made by shaving off thin pieces from a large flavored chunk of ice, creating the wavy and soft “snow” effect. This dessert is made for sharing. 2575 Telegraph Ave, Berkeley, VampirePenguin.com. Fish-shaped cone? Check! Taiyaki, the popular Japanese snack of fish-shaped pancake, is usually filled with red bean, but at Uji Time in Berkeley, you can also get soft serve in the fish cone. Flavors include black sesame, tofu, matcha, and a seasonal flavor — the current one is lavender. Note: Fish cones take a while and are limited in supply each day. It is conveniently located in the space next to Vampire, so why not go for a dessert crawl this summer? 2575 Telegraph Ave, Berkeley. Old school meets new school with this creamery. With a location in Alameda and one in Old Oakland, the shop’s flavors are unique and subtle. For those who love milky ice cream, grab a scoop of Thai tea or Vietnamese coffee, or build an ice-cream sandwich with Cookiebar’s hot-out-of-the-oven warm cookies. They have one of the best cookies ’n’ cream scoops in town. CookiebarCreamery.com. The Cheeseboard Collective in Berkeley's so-called "gourmet ghetto" serves some of the best California-style pizza around, and it certainly doesn't hurt that it's also a democratically run business where workers are owners who share the profits. Besides cheese, pizza and baked goods, the pizza shop also sells buffalo milk soft serve in sweet cream or chocolate flavors. The milk comes from Double 8 Dairy, a small f water buffalo farm in Petaluma. The resulting soft serve is rich, creamy and delicious. 1512 Shattuck Ave, Berkeley, CheeseboardCollective.Coop.